hramvsr.by/просвещение/публицистика/Алла Матренчик "Всех скорбящих Радость"
Snow had fallen suddenly. It covered theground, hiding even the smallest sign of the frozen puddles. Oh Lord, if only someone would help to carry these bags - thought Va-Icntina Tckhanovich in despair, as she tried with difficulty, to maintain her balance on her walking sticks. The icy road from the shop to her home seemed to her, with her disability, impossible to overcome. The anonymous crowd passed her by carelessly and disappeared into the falling dusk.... Maybe I can help you - she heard suddenly, and thanks to Lydya Pronin she reached home safely. The meeting also led her to the Parish of Our Lady, Joy of the Disconsolate. An Orthodox Church in a tent? - At the crossoads between Glebka street and Prititsky street - today the Minsk taxi-drivers have no difficulty in finding this parish, though five years ago there was an open field in this place. On the 26th of April 1991, a huge stone was consecrated in the field, for the foundations of the Orthodox Church "The Icon of Our Lady, Joy of the Disconsolate", in prayerful memory of the victims of the catastrophe at Chernobyl, whose number, unfortunately, continues to increase. The April celebrations came to an end and only Father Igor Korostielov remained on the windswept five-hectare plot. He was to take charge of the building work. He was to take charge of the building work. - I had only five kopeks in my pocket - recalls Father Igor today. His first activities were with children in rented school rooms and prayers said here in the open field, at the foot of the great stone. Then some people arrived, rather unusual people. - I felt that it would be enough to give them a spade, and they would start the building work - says Patriarch Aleksy II, who visited the parish shortly afterwards. On more than one occasion they were soaked to the skin during prayers, before they had even started work. They began to think of some kind of shelter, even a small tent. The army provided the tent. It turned out to be so huge, that they created their own Orthodox Church inside it with the iconastas and the altar. But the walls and roof were a tarpaulin. - In the summer we had to sell candles in a bucket of water, because they melted in our hands; in the winter the temperature falls to below -25°C-saythe parishioners. Everyone was frozen, the choir too. And since students from the Music High School should take care of their voices, they were supplied with smouldering coals in a bucket to provide warmth. - even so, everyone gazed impatiently at the slowly rising walls of their first, brick church, the Orthodox Church for baptisms, devoted to St. Eufresia Polotska. The church arose from bricks bought by the Society for the Blind and its foundations were funded by offerings from the Bielorussian Disabled Society. Both societies, regarded the parish as their own, as did the victims of Chernobyl. And it. in turn, decided to open wide its doors to them, and together with the Lord, to enter the hospitals and prisons, and to embrace the most needy with the care of a sisterhood of more than 30 women. "Fate gave us our "little shelter" -writes Valentina Tekhanovich in oneofherpoems. She regards Lydya Pronin, who continues to visit her, and whom she met on that memorable winter's evening, as someone very close. Valentina is suffering from cerebral paralysis which is steadily getting worse. It is very difficult for her to walk, and hard too, to live, because her financial situation is very tight. Her husband does have work, but his company often comes to a standstill and has debts so that he often does not get paid. The bureaucratic state organisations are little concerned with social welfare, and in any case, their coffers are empty. How then, can a family of three survive on just 385 Byelorussian roubles? - We get food and clothes from the parish - says Valentina - For that we are very grateful. Not to mention friendship, without which it is not possible to live. It is not possible to live without medicines either. W hen recently, she was admitted to a Minsk hospital with the symptoms of severe food poisoning, the doctors had no difficulty with the diagnosis. But they could offer no treatment, because the symptoms of the deep economic crisis of the state are concentrated in the Bielorussian health service. The hospitals have no drugs, drips or syringes. -Please buy them with your own money - the doctors tell the patients who have been paying health insurance all their lives. But where can they be got? My church helped me - says Valentina, moving with difficulty around the house on her walking sticks. One of the sisters from the "little shelter" comes to bath Tatyana, prepares her for confession and communion and brings her various food products which reach the parish in the form of humanitarian aid. She comes to work and help free of charge, leaving her own family and personal affairs. - Our help is very individual, because we are concerned with sick individuals-says Tatyana Tchystyakova, who works in the sisterhood. A great number of the Bielorussian faithful have followed their children to church. Whenever she comes across the helpless misery of the disabled, most often hidden behind closed doors, she is unable to pass by unheeding. 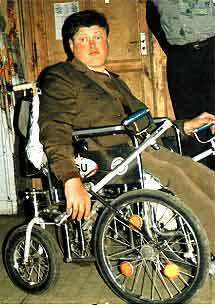 Inthe post-communist landscape of Minsk, one rarely sees any disabled people. They hide with their troubles in microscopic apartments, with narrow doors to the bathroom and lift, inblocksofflatswithout special facilities for the disabled. Those we look after, vary a great deal. The blind, the paralysed, those with multiple sclerosis and cancer. Also those who have come from Chernobyl, and those who helped to clean up after the disaster. They never cease to dream about their family homes and gardens, and they struggle with the difficulties of everyday life and very serious illnesses. They come to their Chernobyl Church, and they no longer hurry to get anywhere. They light candles for the latest of theirfriends to have died as a result of the catastrophe. They raise up offerings. One of the men working on the power station brought us more than 40 icons - says Father Igor. Before that he used to work for the Police, in the section dealing with theft of sacred objects, works of art and church property. Now that he is ill, he has taken care to ensure that some of the icons from the illegal smuggling, found on the Bielorussian border, are brought here, to his church. Twice a year the parish organises meetings for the disabled and sick. After performances by the children from the Sunday School, Valentina Te-khanovich offers thanks with her poetry; a blind professional artist, Olga Patryi, gives a song recital and someone else shows their paintings, embroidered landscapes, painted yearnings. And as a whole, huge, suffering family they count the time thatremains for the full realisation of their plans as a parish. - It is a beautiful beginning, the spring-time of a great undertaking - says the German Pastor, Herbert Wohlhuter, carefully taking in the parish's assets. The recently consecrated Orthodox Church for baptisms of St. Eufrosia Polotska makes its mark on the landscape, and alongside it, the large Sunday School building is taking shape. The outline of the main church is now clearly formed, and new foundations have been laid. The building materials and builders' stores occupy a large part of the area. Close to the entrance stands the "little shelter", and it is sad that it is now no longer really required. Pastor Wohlhueter came to Bielarus for the first time in 1991 in connection with the 50th anniversary of the invasion of the USSR, as part of a large 260-strong delegation. I would like to meet with an Orthodox Church leader, who is engaged in the diaconate, he asked his hosts. 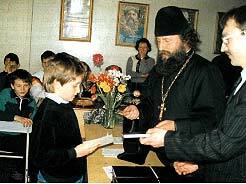 On the last day of his visit he was introduced to Father Korostyelov. - I had visited the hospital, the prison and the boarding school for children with psychiatric problems for the first time, and encountered the arrogant remarks of the terrified staff and seen tears in the eyes of the oldest patients and prisoners – remembers Father Igor. Pastor Wohlhueter had worked for many years in a small town for the disabled, called Bethel. They soon found they had a lot in common. Thus the idea was born, that here in the Minsk Chernobyl Parish, there should be founded a centre of God's mercy -with a house for the elderly, workshops for the disabled, and a free canteen for the poorest. The Germans offered medicines, food and clothes. They hosted the pupils from the Sunday school and the sisters in Bethel. They demonstrated their facilities and taught the visitors new skills. It turned out to be quite easy to change a sheet under a paralysed patient - we had been doing it the hard way - says Tatyana Tchystyakova. Together with a friend, she has recently completed a two-level course in Bethel. She learned how to bathe patients in a professional manner, how to speak with them, how to dress wounds and give injections. From the autumn, she will start to teach others here in Minsk. From Bethel, she also gained a whole mass of ideas, though they will be difficult to fit into the two rooms of the Sunday school. That is all that the parish is able to offer the sisterhood. Should the machines which have been brought from Germany, be placed there and a room for occupational therapy used? Maybe it would be better to create a room for rehabilitation? Because the workshop for the disabled, and an old peoples' home will have to wait. Closest to reaching fruition is the canteen for the poor, but it, too, is only just rising above the foundations. The average Bielorussian monthly salary buys 600 bricks, so how much money is needed to complete the planned investments? Help comes from Bethel, from "Diakonisches Werk" in Germany, from the World Council of Churches and many Bielorussian companies. -But so much is being built here - explain the sisters, and dream of a car for the sisterhood. 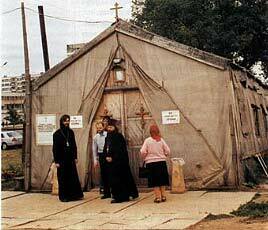 In a year's time the Chernobyl Parish and the church "shelter" expect to receive women visitors from many countries. On the 1 Oth anniversary of the Chernobyl disaster they will plant an orchard of hope.